:: Dan and I were able to get away for an overnight -with Iris- in Texas Hill Country. We checked into the hotel, grabbed a bite to eat and then all took a three hour nap together. Dan and I both fell asleep with our books in our hands. Yes, it's an exciting life we lead! 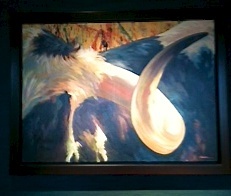 The hotel had a cattle theme, long horned of course. 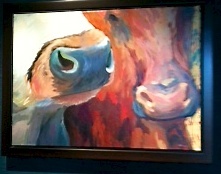 My parents have a free range beef farm in Wisconsin, so these paintings especially delighted me. 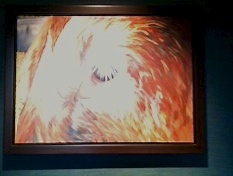 I'm posting pictures of the paintings for them. 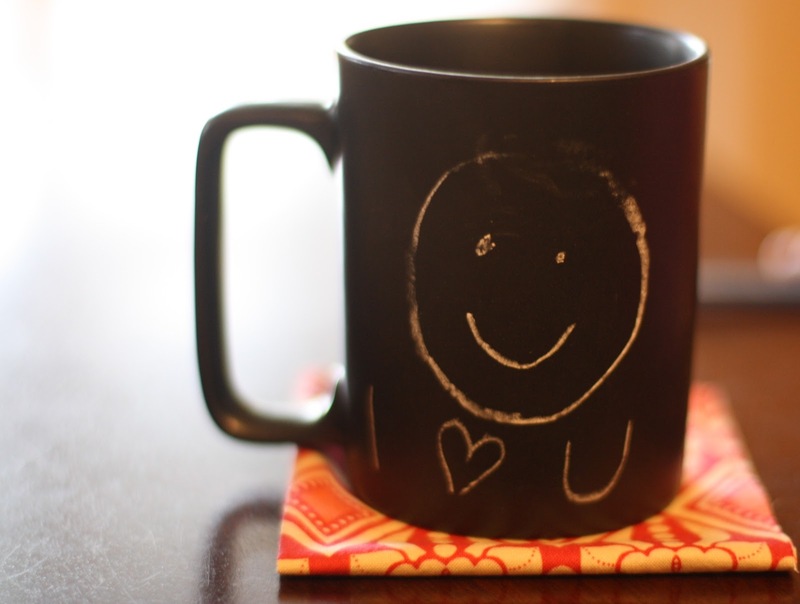 :: Chalkboard paint seems to be everywhere these days, but I did not expect to find it on glassware. Dan got me this mug so he could leave me notes in the morning. 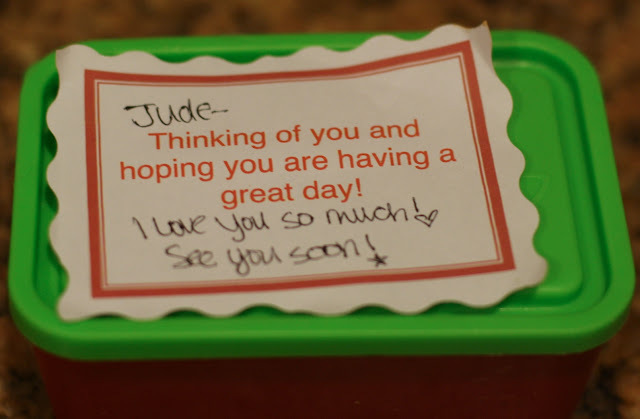 :: I love to leave Jude notes in his lunch box and these free printables make that even easier! :: Evie has a dairy allergy (like the kind that makes her face rashy and swollen!) so I have to cook and bake dairy free. You might imagine my trepidation as I attempted a dairy free birthday cake and icing(!) for the first time. Fortunately, this recipe for vegan chocolate cake was delicious. Even if you aren't dairy free, this cake is awesome... and it's inexpensive to make. For us, it baked quicker than the recipe indicated, about 35 minutes. I added 1/3 cup of floured dark chocolate chips to the batter. Yum! :: We used this recipe for the icing. :: This bread recipe was fantastic. Indigo said it was the best bread I've ever made. It was super easy to make in the bread machine. In general, I let my machine handle the dough and then I bake it in the oven. I baked this loaf at 375 for almost 35-40 minutes. I brushed it with egg white and sprinkled it with kosher salt. It came out airy and fluffy, not dense like some homemade loaves. :: My mom suggested that I make meals in double batches and put one batch in the freezer. I am slowly building back our freezer stash after the door was left ajar overnight. 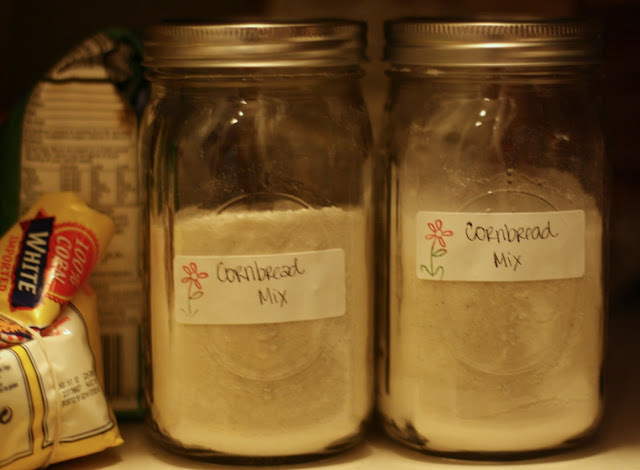 When I was making cornbread today, I decided to make a few mixes for the future. 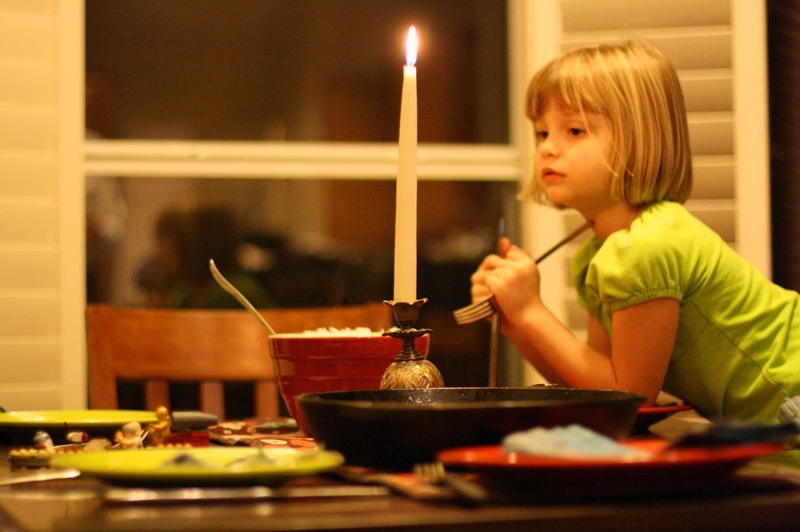 Do you have any tips for making the dinner hour easier?